These young sheep are the future of the Plaw Hatch Flock. In all there are twenty-one ewe lambs in this group all of whom where born in April 2017. 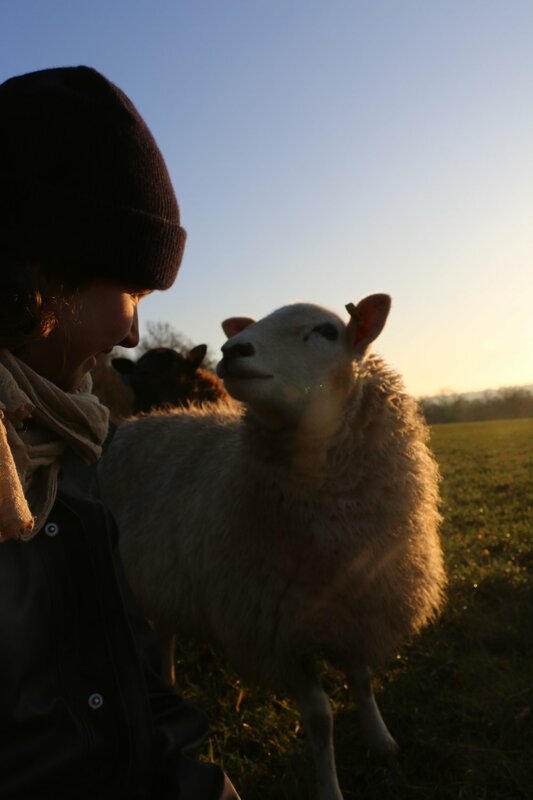 All of our ewe lambs have a year and half to grow up and bond with their flock mates before they meet the rams. The white ewes in this group are pure lleyn whilst the brown and white ewes are Jacob x Lleyn. The ewe above is the only one in the group who has real Jacob markings. We will be shearing all of these ewes for the first time in May of this year. I am really excited to have the beautiful shearling wool of the brown Jacobs blended with the wool of the pure Lleyns. The ewe lambs are very affectionate towards each other. Our ewe lambs are very curious about us. Mostly I check the sheep everyday myself and I try to spend time sitting in the field with them so they get used to me being around. This really helps keep their stress levels low when we need to handle them and it helps when it comes to them lambing. This little one who is investigating my face is from a line of particularly friendly sheep. I knew her grandmother when I first came to the farm, no. 22. No. 22 had triplet daughters 3 years ago and this ewe is the daughter of one of the triplets. I love knowing the lineage of our sheep. Keeping our flock closed, for the most part, means I get to rear the future breeding ewes from lambs and build a relationship with them. Buying in the Romneys has been an interesting experience they are beautiful sheep but it will take a long time for them to trust us. Eventually they will learn from our homebred ewes that we are safe.